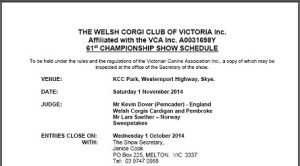 The Welsh Corgi Club of Victoria is proud to release the schedule for the 2014 Championship Show. This years show will be held on Saturday, 1st November 2014, and the Judge will be Mr Kevin Dover (Pemcader, England), and entries close on Wednesday, 1st October 2014. This entry was posted in Blog, Events and tagged 2014 Championship Show, Championship Show by WCCVAdmin. Bookmark the permalink.